Bird fancier's lung is a type of allergic alveolitis ("alveoli" are the air sacs in the lungs and "itis" means inflamed). In America "allergic alveolitis" is usually called "hypersensitivity pneumonitis". It is an inflammation of the parts of the lung were oxygen is taken into the blood. Breathlessness and tiredness are common symptoms, many also lose weight. The main agent that causes the allergy is the bloom on the feathers (the dust that comes off which keeps the feathers sliding nicely over each other). It comes from the preen gland (also known as oil gland or uropygial gland) found under the base of the birds' tail and is spread over the feathers with the beak. The droppings can also be a problem if they dry and are inhaled. Most good quality flying birds keep their feathers in good condition, resulting in lots of bloom. Chickens on the other hand are usually very scruffy and allergy to chickens is uncommon. Birds visiting your garden are an unlikely cause, most problems occur from birds kept indoors or in breeders. Outdoor birds are generally too far away to be a problem. This can be a fairly serious disease with breathlessness, fever, weight loss but not usually with wheeze. It gets better when away from birds, and may need other treatment such as steroids. It will recurr when in contact with the birds. A blood test is availble to check for antibodies to avian proteins which is suggestive of disease. There are however more people with antibodies than disease (ie the antibodies can be harmless). There is a lot of cross over between antigens (the things sufferers are allergic to) from different birds and most people think that testing for pigeons and budgerigars is sufficient and will pick out allergy to other birds. 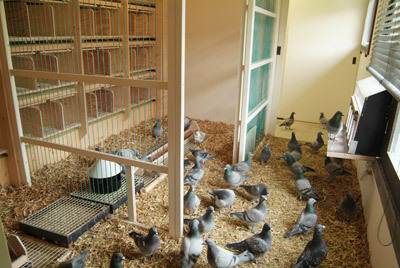 The racing pigeons association laboratory in Glasgow, UK provides the reference service. Blood can be sent to Dr C McSharry, Department of immunology, Western Infirmary, Glasgow, G11 6NT. Further exposure to the bloom (or dust from dried droppings) can make the disease worse. It takes a long time to remove all the bloom from a house or other environment, so if a test is needed to see if the birds are the cause it is better to move the person than the bird (an excuse for a holiday away from home for 4 weeks). The future is very unclear. There are pigeon breeders who keep their pigeons, reduce their exposures and stay well (Bourke Thorax 1989;44:415-418 - this paper is very technical). There are a few who get worse even when exposure ceases. If the disease is acute, with weight loss being prominent, substantial recovery should be the norm. You can see if you are still being exposed to the bird antigens by repeated measurements of your IgG antibodies against the bird proteins. They should go down, and usually become negative after about 3 years of avoiding exposure. Dying from acute bird fanciers lung is extremely rare. Occasionally infection can spread from birds to people. The bird is usually ill (off its seed, green stools, lethargic). The infection is called psitticosis and is uncommon in birds reared in captivity. This causes a pneumonia-like illness rather than any longterm breathing problems. In the UK the infected birds are usually newly imported from the wild, particularly from south america. This should not recurr once you have had it. Psitticosis can be diagnosed from a blood test (Chlamydia psitticae antibodies) which are offered by most standard microbiology labarotories. There are however more people with antibodies than disease (ie the antibodies can be harmless). Asthma can be due to birds, but is uncommon in our experience. If you are worried about asthma due to birds, the best thing is to see if you are better when you are away from the birds. It would be worth keeping occupational type records of your peak flow, before during and after a holiday away from home (you can get information about doing this from this website). It is better for you to move rather than the birds as the allergens from the bird stay in the environment for a long time after the bird has gone. I have kept chickens for 25 years. I have just started to feel breathless, weak and unwell when I tend to them. Whilst away from them I'm okay. I keep around 60 birds, some in a stable, a shed and others with walk in houses. Can you please tell me do my symptoms mean anything or do I just perhaps just have a bug. Chickens are an uncommon cause of alveolitis, it would be important to see if you have alveolitis (a chest X-ray, listening to your lungs for crackles, breathing tests including gas transfer, DLCO). If alveolitis is confirmed, then tests for avian antibodies and removal from exposure is best. If you have asthma rather than alveolitis (breathlessness and wheeze, but weak and unwell uncommon), there are many causes related to keeping chicken, particularly if you are breeding them. Red spider mites are one of the commoner causes. Serial peak flow measurements on days at home looking after the chicken, and days completely away from the chicken (details on this website), would be the next step. Perhaps it is nothing to do with the chicken? If one develops bird fanciers lung, it is recommended that exposure to the birds are completely avoided. This does not however guarantee that the disease process will cease entirely in all cases. i.e. in some who develop the condition, the disease may progress or be active in spite of removal of exposure to birds and bird antigens. Ideally, all those who develop bird fanciers lung should be monitored longitudinally in a specialist chest disease clinic and receive treatment where appropriate. X-ray is not a sensitive test by itself in monitoring the disease but forms a part of the available tests used by a chest specialist. Iwould like some advice. November 1, 2010. We purchased a young blue crowned conure. 1 week later I developed laryngitis, which turned into a cough. I have had this productive cough ever since. I have never smoked and we only have one bird (I had a macaw for 18 yrs, it passed away 4 yrs ago). My chest xray, ctscan and pulmonary function tests are all normal. My parents took the conure for 2 months as a test to see if the bird is the cause (my pulmonary doctor thinks it is, but I tested negative to the skin prick test for budgies and chickens). During the 2 months there was improvement but not long lasting, the cough always came back. I have the bird back now, within 24 hrs of bringing the bird home, I have come down with a fever. The fever is not accompanied with shortness of breath and is only at night, for 2 nights in a row. I have always been very healthy. Could I be having an allergic response to my bird? It is possible that you have developed avian aveolitis but the story is not typical, particularly the persisting cough. However the fever on return to the bird is much more in favour of alveolitis than infection (such as psitticosis) which should only have occured on the first contact. The blood test to do is of IgG antibodies to avain serum(or precipitins) for alvelitis and to Clamydia psitticae for psitticosis. The skin prick test identifies IgE antibodies, more related to asthma than alveolitis. If the lung function tests are truely normal (including gas transfer, DLCO) and the CT is normal, alveolitis is unlikely. I think the best way forward is another try at separation from the bird. I have just been told I may have bird fanciers lung or farmers lung. I have been told to get rid of all my animals. I have chickens, ducks, geese, 2 dogs, a budgie and a rabbit. Do you think it is only the birds - My animals are my life. I can't imagine what I would do without them. I have been keeping chickens for 20 years. Does anyone know if masks work and what sort of masks. I have no cough just pain in my upper back between my shoulders and I feel tight across the chest most of the time. I don't wheeze but My peak flow is never higher than 400. I have children and the doctor says I may be flat on my back with oxygen in 10 years - please advice greatly needed. Bird fanciers lung and farmers lung are both types of allergic alveolitis (or hypersensitivity pneumonitis as it is known in the USA). Although the disease is the same (alveolar inflammation) the cause is different (avian proteins for bird fanciers lung and fungal antigens for farmers lung). It is important to find out which is the cause for you. The usual method is a blood test for precipitating (IgG) antibodies. Bird fanciers lung is tested against chicken and budgerigar serum, farmers lung mostly against Mycopolyspora faeni, Thermoactinomyces vulgaris and Aspergillus fumigatus. Finding positive antibodies alone is insufficient, as many exposed people have antibodies but no disease. However if you have allergic alveolitis and are exposed to moulds and birds, the one with the positive test is the most likely cause. Budgerigars are a much commoner cause than chicken, geese and ducks would be very rare causes, dogs and rabbits as far vas I know have not caused alveolitis. Can you tell me what tests are available to check for bird fancier's lung. My partner has convinced himself that he has it, but he isn't coughing or wheezing all the time. We have one cockatiel indoors. Bird fanciers lung causes breathlessness, but not often wheeze. The disease is diagnosed by history (being better when away from the bird for several days), by finding crackling noises when listening to the lung with a stethoscope, and finding reduced breathing tests (particularly gas transfer, DLCO, usually only available in hospital labs). The chest x ray may be abnormal, but is often normal. Blood tests (precipitins) can look for antibodies to avain serum (or droppings). Cockatiel tests are not usually available, but tests for bugerigar or pigeon will usually be sufficient. A positive test is found in exposed people who can have no disease as well as those with bird fanciers lung, the stronger the antibodies the more likely they are to represent disease. The tests become negative after exposure ceases, and there are a few people with bird fanciers lung and current exposure in whom the tests are negative. If you are concerned it is worth doing all these tests. As you get better away from your bird you should have tests to find out whether the bird (or something else in your home) is the cause. The simplest test is a blood test for IgG antibodies (precipitins) to the bird's blood (not droppings). Most parakeets cross-react so the test does not have to be to your own birds blood. A positive test does not mean that the bird is definately the cause of the problems, but makes it more likely and further tests are needed. The CT scan usually shown changes of alveolitis when the bird is the cause, the signs can be quite subtle, such as areas of darker and paler lung (mosaic attenuation), or small nodules (many not one) or ground glass opacities, it would be worth somebody having a specific look at your CT for signs of bird fanciers lung. The lung function changes of emphysema and bird fanciers lung can be similar, both can cause low FEV1 and FVC, both a low gas transfer (DLCO) but emphysema should make the lungs bigger (high total lung capacity and high residual volume) and bird fanciers lung lower. If you have both the total lung capacity (and residual volume) will not be as high as expected for pure emphysema. If the diagnosis is still in doubt it may be worth doing a bronchoscopy with lavage of saline into your lung and a count of the cells retrieved, bird fanciers lung causes an increase in lymphocytes (this needs to be done in an area of lung without emphysema, as it is difficult to get the saline back from emphysematous areas). If you have emphysema it is likely you were (or are) a smoker. Bird fanciers lung is actually more common in non-smokers, if you have recently given up smoking this may precipitate bird fanciers lung which was being supressed by smoking. The main source of allergen from a bird is the bloom on its feathers, this is often higher on well kept birds and is not removed easily with cage cleaning. It would be nice if you posted a follow-up in due course to let us know what happened. I have sever asthma, and lately I have noticed allergy symptoms when in contact with one type of bird, if he bites or scratches me I swell up and it itches incessantly. He is a Quaker parrot, a member of the Budgerigars family. The cockatiels I interact with daily and the Green cheeked Conure DO NOT cause the same reactions. Is it possible I'm only allergic to The Budgerigars? I have an allergy test sched, but that will take MONTHS to get. Removing him from where I live( I volunteer with an animal rescue organization) alleviated all symptoms. My concern are the 3 birds that I live with, whom I love dearly, and other animals I may take in in the future. IS it possible to have allergic reactions only to certain breeds? I was diagnosed 2 years ago with Bird Fancier Lung. I was given a dove by a friend of mine 9 years ago and after about 2 years with the dove I started having shortness of breath and coughing all day long. I found that it would get worse as soon as I closed the windows up for the winter. I also had a cat and dog so I thought it might be one of them. I finally went to an allergist who tested me for all types of animals and other household things. He came up empty and just called it asthma and eventually had me on 3 asthma drugs which didn’t help at all. After coughing for 5 years I finally went to a specialist who tested me for 8 exotic birds and found that I had Bird Fancier Lung from the dove. I got rid of the bird and totally cleaned my house, painted the inside and got new rugs. This helped me immensely up to a point where I still cough about 25 to 35 times a day and never seems to get any better. I cough when I roll over in bed, laugh, do any physical activity or come in from the cold (not when I go out in the cold). In the 6 weeks something has drastically changed. I had a gall bladder attack and was put in the hospital and given large doses of antibiotics for 7 days. When I got out they gave me a prescription for 10 more days of antibiotics. I caught a cold leaving the hospital and coughed severely for 2 weeks. When the cold was over I found that my bird fancier lung cough had all by stopped. I had my gall bladder out after the three weeks and when I came home I still was not coughing. After being home for 2 weeks I have noticed that my coughing is beginning to pick up a little. I have 3 air filters running all the time which I’m sure helps keep the air clean, but my doctor told me I would never be able to clean the house enough to get rid of all the bird dander. My question is that is it possible to cure the bird fancier lung with large doses of antibiotics. It seems that I am real close to being cured by taking the antibiotics and maybe if they kept me on them longer it might have cured me. Is this possible? Bird fanciers lung is an allergy and not an infection, so will not respond to antibiotics as such. One group of antibiotics (the macrolides) also work to reduce inflammation in a lower dose than needed as an antibiotic; they might account for some benefit in bird fanciers lung. The precipitin test (IgG antibodies) in the blood are unlikely to differentiate between the parakeets and pigeons. To get bird fanciers lung your have to breathe in material from the bird to which you have become allergic. Most of this comes from the bloom which coates the feathers and keeps the feathers in good condition, this is to reduced by cleaning the bird cage. It used to be thought that the droppings were the main problem. To breathe these in they have to dry (often a long process). It may be a problem in some places where the droppings are left for a long time. I'm afraid it is more likely that your Amazon is the cause of your problem. It should be fairly easy to remove the pigeons from your office window sill. I would get somebody else to clean this and install netting/spikes or something else to stop roosting. If you are removed from exposure your pricipitin tests (or preferably the titre of your IgG antibodies to pigeon antigens) should halve about every 6 months. If they dont go down it suggests you are still being exposed. i am a macaw owner....16yrs....i have just acquired shortness of breath which causes severe dry coughing. to the point where my bird is saying owww owww! when she hears this . she is pretty cuddly . we spend a a fair amount t of time together when i am not working. i feel good only when i am sleeping which is s 2 sstorey above her cage area. it seems when i go to work though i am worse. and she is n o where near me but it could it be the ledges? what tests are necessary to find the cause? If you are really beter away from your macaw it makes her a less likely cause of your breathlessness, often longer periods away are needed to show improvement. There are many causes of cough and shortness of breath, you should see your doctor about this. tell your doctor that you have a macaw, he should at least exclude this as a cause of your symptoms by listening for crackles in your lungs (uncommon with many causes of breathelessness), do a chest X ray (can be normal in bird fanciers lung), measure your lung function including gas transfer (DLCO), a low DLCO would be unlikely in other causes of lung disease at your age, and measure your IgG antibodies (precipitins) to bird sera (a positive test makes the bird a more likely cause of your disease). If you are worse at work tell your doctor this as well, the cause may be at work (occupational asthma). My dad has bird fanciers lung. Is it hereditary? No. However, if you consider that individuals have different degrees of susceptibility to any environmental dises - those with HLA-DRB1 related genes are more susceptible to bird fanciers lung. Therefore, it is possible that you share the same susceptibility as your forefathers to develop bird fanciers lung, if you have had similar exposure as they have had. Major histocompatibility complex and tumor necrosis factor-alpha polymorphisms in pigeon breeder's disease. Camarena A, Juárez A, Mejía M, Estrada A, Carrillo G, Falfán R, Zuñiga J, Navarro C, Granados J, Selman M. Am J Respir Crit Care Med. 2001 Jun;163(7):1528-33. I have had shortness of breath and wheezing for years and I have a starling, the doctor told me it was from smoking I quit smoking and the wheezing went away but Iam still out of breath it does seem to go away when Iam not in the house for long periods of time but I can't move right now. what I would like to know is if it is the bird and I get rid of it how long before the symptoms start going away? and would it help if I put the bird in another room and get an air filter? Does this affect in pregnancy in any way? Smoking causes COPD (chronic obstructive lung disease, which includes emphysema) wthis is not caused by allergy to birds. Birds mostly cause allergic alveolitis, and sometimes asthma. All can causes wheeze, but listening (with a stethoscope) might reveal crackles, which are not caused by smoking but are often present in allergic alveolitis. A full set of breathing tests should also help separate the two. Alveolitis and emphysema cause a reduced gas transfer (DLCO), the two can usually be separated by measuring the total lung capacity (up in emphysema and down in allergic alveolitis). Detailed tests are necessarry. Finding antibodies (precipitins) to birds in your blood would also make alveolitis from the bird mor likely. Finally a high resolution CT scan will separate the diseases. My son & I were living in a house that had hundreds of pigeons living in the attic. Their feces covered the entire attic. When we would turn on the heater, thick dust would come out, which we later found out what the dried organic dust of from the feces that was blowing through the air vents. It wasn't until we became ill that we figured out that it was from this. My son had an high IGG level to pigeon feces. Are there any other tests that we can ask our doctors to test us for? Hello, I am a doctor and had to clear the last entry up. You can NOT get bird fanciers disease from dogs, nor Histoplamosis, or any other bird/pigeon related diseases. That is completely false. If you are commenting on here, you shouldn't print things that are untrue. If anything, your husband was probably allergic to the fur on that type of breed, or maybe to all breeds. I suggest getting a dog that has "hair", as opposed to "fur". They are more or less Hypo-Allergenic for allergic people. RE: the entry from 6/6/12, your son needs to see a pulmonary doctor ASAP. In order to have high IGG to pigeon feces, you must have had very long exposure to pigeon feces, and there must have been an extreme amount of feces. If you or your son are having any breathing problems, or if you are wheezing, feeling flu-like, have fevers, etc, you really need to be treated ASAP. Having exposure to pigeon feces can have a very severe effect on your health. You need to be seen and have a full eval ASAP. Some parakeets have an infection which can be transmitted to humans, causing a flu-like illness sometimes with pneumonia or cerebral symptoms. It is very unusual from birds bred in captivity, but can occur in recently imported birds. This is completely different from bird fanciers lung (allergic alveolitis/hypersensitivity pneumonitis) which are the concerns of most of the questions in this section.Although fever and cough can be due to bird fanciers lung, it would be very unusual for this to affect several people at the same time, and after such a short exposure to the bird. The organism causing infection is called chlamydia psitticae, blood tests can detect this infection which responds to some antiobiotics. hi i just found out about this disease and currently have a few of the symptoms. i'm trying to make sure i do or dont have it. i'm going to see a pulmonologist next week but i have a few questions. i know coughing is one of the symptons but is it a dry cough or a productive one? mine has been productive. also, does this disease always show on xrays? i've had two and both were 'normal'. i didnt mention that have a bird so maybe they didnt look for the disease in the x-ray? i have one bird, a green cheek conure who i've had for over 4 years. any feedback would be much appreciated. thank you. The cough is usually but not always dry. The Chest X-ray may be normal with avian alveolitis. The most important tests are listening to your lungs for crackles, and breathing tests to incline DLCO (gas transfer) as simple test of spirometry may be normal. You should also have a test for precipitins to birds in your blood, but some bird fanciers with positive precipitins have no disease. I have just been diagnosed with pigeon fanciers lung and I am on a course of steroids. I was allergic to our pet budgie which we have since got rid of. I work in the community visiting clients homes which may have pet birds in and also mould on carpets etc. Should I avoid these situations. This is a difficult question. The allergy to birds is specific, that means that your allergy is only to proteins from birds, particularly from the bloom on the wings and their droppings. Moulds are a different cause of alveolitis, you should have no problems with these. More casual contact with birds in others houses could cause problems and at least temporarily should be avoided. Your antibodies (precipitins) should go down the longer you are away from exposure, if they dont go down (or go up) it is likely that you are continuing to inhale bird protein. Once you are off steroids, and if you are keen, a trial of casual contact could be done. You should have measurements of your breathing and antibodies regularly to see if you are getting problems. My husband has suffered over four years from shortness of breath, chronic fatigue, severe coughing spasms 24/7, and minor weight loss. He also is cold nearly all of the time. After lung biopsies, MRI's, catscans, and countless blood tests at the top pulmonary hospital and others, he went to the Mayo Clinic in Rochester, Minnesota this week for testing as a last resort. He called me a short time ago and told me that the diagnosis is Allergic Alveolitis (Hypersensitivity Pneumonitis), as it showed up in blood test results. We did purchase a parakeet in April but did not see any greater decline in his condition since then but rather the same steady deterioration of his condition. He has had no other exposure to birds other than those that fly by in the sky. We've had the same down comforter for years, live in a fairly new house (6 yrs old and only 1.5 yrs old when his symptoms began), and had the house ductwork cleaned but there was little dust found. There are no other aviary associations. Is it possible to receive this diagnosis for a possible aviary bi-product? His business is oxygen regeneration devices which include carbons and coconut shells. He travels 50-60% of the time and doesn't feel any better or worse when traveling. We're pretty sure that we have to give sweet little Lucy away (children's first and only pet) and will get rid of the down comforter, but cannot think of anything else that we can or need to get rid of. He's been on various steroids and antibiotics for extended periods of time and nothing has worked. Can you help us figure this out? Thank you. Is he at all immuno-compromised? Does he he take any meds for any health condition that would stop his immune system from working properly? For example, any meds for an auto-immune illness? And is it at all possible that there is any mold in the house? Maybe from an internal leak? Thank you for responding. No, he is not immuno-compromised. No, he is not currently taking anything but ibuprofin. No, there is no mold in the house and no internal leaks. We are brain-storming as a family right now trying to think outside the box regarding his exposure and can't come up with anything. The allergic alveolitis seems to have been diagnosed from blood tests. These are likely to be precipitins (IgG antibodies) to a specific allergen, you need to find out which was positive. If the tests are for avian antigens some use avian serum, which does not have serious cross-reactions with other materials, but others use avian droppings which have a lot of things in them other than avian proteins and cross-react with many other microbial agents. A positive IgG antibody test does not mean that the bird is necessarily causing disease, there are many bird fanciers with positive tests and no disease, however in the presence of a disease which is clinically allergic alveolitis a positive IgG test would generally indicate that this was the cause. The cause however should be present before the disease, which seems not to be the case here. Ways forward would include measuring lung function (including DLCO) while living at home and after a break (?holiday, but leaving the bird behind) of at least 2 weeks, the second measurement being made before return home. Improvement would indicate that the cause was at home (the bird being a likely cause). Perhaps the bird needs to go in any case, but further investigation is needed to confirm the diagnosis of allergic alveolitis (rather than its cause). I forwarded your post to my husband and he is going to share it with his local doctor - the one who referred him to the Mayo Clinic. He's going to ask which type of test was done. I strongly feel that there is an underlying condition causing his symptoms that remains undiagnosed. He is going to request the results of blood work done prior to acquiring a parakeet and have the doctor review them. We have not yet given Lucy away until a comparison of test results has been done. I'm not sure whether he's had the lung function measurement or not but he's taking your response with him so I feel better about him being able to ask more specific questions about the prior testing. Thank you for sharing your expertise; it is appreciated. My neighbour has been a labourer and five years ago had to clear out a loft that had been infestated with pigeons. After working on the site he developed breathing problems. He has never smoked and was always really fit. He has been to the Doctors but they have just said that it is as asthma but his wife is convinced that it is not the case. I am trying to do some research on their behalf as would really like to help improve his breathing for him. He sounds very chesty and coughs up a lot of flem all the time. Appeared I had been scalded and with flaky skin. I have a health problem ? Asthma is a common cause of breathlessness and has definite tests that can confirm the diagnosis (bronchodilator reversibility, non-specific reactivity, increased diurnal variation in peak flow, response to a trial of treatment etc.) None are found in all asthmatics, but most have at least one of these. If thge reaction occurred on your first exposure to seagul guano it is more likely to be irritant than allergic, both can cause skin problems. Weight loss is more unusual but could be due to organic dust toxic syndrome, if so it should improve fairly quickly. If weight loss continues it is important to seek medical advice. Thank you for your speedy response regarding the gull guano.i have had some tests done and my blood pathology states pidgeon droppings igG [26-50]was 67.7 and chicken droppings igG [10-40] were 41. both chicken and pidgeon feather counts igG were also on top of range.I am led to believe that pidgeons are used as a base for all non aviary birds is that correct assumption?i am having a chest x ray and further blood samples and am short of breath would this be indicative of contamination of guano in my body? Our small parrot, a family pet, needs a new home according to our pulmonary Dr. My husband has COPD w/asthma, allergy test to birds negative. He was not allergic to hardly a thing. I am wondering what we can do to be sure that finding our loved pet a home is the right thing. He wants to be assured that this is right. He is not responding to steroids, antibiotics, inhalers, etc. He has a rattle in one lung and has a bronchoscope scheduled. Dr. feels that he may have a blockage. symtoms are worsened with any activity; he has no life in a recliner day after day. He is 72yrs old has been very active until these lung problems. What do you think? Is there anything we have missed. I feel I have lost my partner. The most important thing is to make a correct diagnosis. If you have asthma or alveolitis shown to be caused by the bird, the bird should go. If not there is little point in removing the bird. If the diagnosis is equivocal a trial separation is a way forward, the patient rather than the bird should go for about 4 weeks, with no return home at all and careful monitoring. Antigens from the bird may still be in the house many months after the bird goes which is why the patient rather than the bird needs relocation. Annoyed me, maybe I should have tried a few preventatives. So I thought about picking the hobby back up. 2 months was not nice. Run a hepa air purifier. Love birds but want to be safe in doing so. Your symptoms sound more like asthma than alveolitis, but both may be possible. They are due to allergy so require a period of exposure before sensitisation occurs (just like hay fever to grass, you are not born with this but starts usually years later despite breathing in the grass pollen every year). Once developed small exposures which caused no problems before rovoke symptoms. Now that you have got rid of the birds it would be much safer to stay away from exposure. Currently got one pair of finches(Siskins) to try. I also wear a mask(ffp3) type and use prevalin nasal spray. And expense available to me. this system then maybe I can continue my hobby. the birds and move on. want to keep myself safe. I moved into my present home in July 2011, since February 2011 I have been suffering symptoms. My question is: Is it possible to be affected by living near someone who breeds birds and has an Aviary? The person living next door to me has an Aviary which adjoins on of his bedrooms at the back of his house, and which is outside my bedroom window? hello i have been sick since mid jan this year, i now have chronic asthma and a lot of tiredness, coughing all night and morning, i am taking note of peak flow my highest reading is 310 i am 31 non smoker, i have also from coughing have fractured 3ribs am in alot of pain alot of the time. i have been in hospital 4times and doctors with same and also worse symptoms and everyone is baffeled as am i. any ideas???? hi this is sick since mid jan, , i just got rid of two of my birds leaving me with one. Is it unhealthy to have my finches housed (caged) in the bedroom? I was diagnosed with PBL in 2007. I have had pigeons since 2005, but quit smoking June 2006 and sick within months. Started smoking again and stayed with my pigeons until 2012, when I started coughing incessantly at night, then became hypoxic. Cat scan showed return of the disease. I still have my birds, but stay out of the loft and where a mask when I'm near....giving baths, changing waters, etc. Last Cat scan showed marked improvement and I no longer have to use the oxygen except while exercising (4 liters) and connected to CPAP (2 liters) You're going to think I'm off the wall, but I would like to use my pigeon droppings as fertilizer. At what point would this be safe to do? The proteins must dissipate eventually? Thanks for your help. You can tell how effective your precautions are by measuring the titre of your IgG antibodies (precipitins) to pigeon antigens serially, say every 6 months. Without exposure they should halve every 6-9 months. If they dont go down it suggests that you are inhaling antigen from somewhere. The test needs to be done quantatively, for instance with an ELISA, and not by looking at precipin lines on an agar plate. I am diagnosed with HP or AA and the cause according to the Pulmonologist: bird fanciers disease. I do not own any birds. My neighbour (30 meters away)has got about 15 parrots in cages outside. I've got a water fountain which means that pigeons (about 40+) regulary come to drink. They also sleep in the trees which surrounds the house, their droppings all over the paving. But that is all outside. Question: Seeing that the pigeons and parrots are all a distance from where I live, is it still possible to contract this disease? "According to the Pulomonologist", meaning that all necessary titer tests were performed? I have my 50 or so pure white pigeons in a loft in my backyard. I have a Blue and Gold Macaw in my house. I was tested both for parrot and for pigeons. I am able to keep my parrot, but must stay out of the loft. I can still take my birds for a release. Their baskets are not in the truck, but in the bed. I hold them and give them to the client for hand release. I am not allergic to the bird. I am allergic to the antigens that their poop produces. Inside the loft, they fly around and all this little dust like particles are flying. I find it hard to believe that a proper diagnosis was made. Ask for a copy of the blood work. I'm the person with the HP / AA written on 25/07/2013. Yes, the specialists performed an open lung biopsy. The pathologists diagnosed the condition as allergic alveolites (AA). The only contributing factors to the illness is that which I mentioned in my Comment. Hence my answer. Having HP, even with a definite biopsy, and having birds nearby, does not necessarily mean that one is the cause of the other. IgG antibodies help, if these are negative during current exposure it makes that cause much less likely. If the antibodies are positive it means that there is some exposure, but not necessarily that the cause is found. A challenge test is ultimate proof. Another option is to measure lung function, including gas transfer, then leave the home without return for 2-4 weeks, then repeat the lung function before returning home. If there is no definite improvement with complete removal from exposure it makes a domestic cause much less likely. If improvement occurs it could still be something in the home apart from the birds, moulds being the most common. An open lung biopsy will show all the characteristics of AA /HP Blood tests: inflammatory markers may be raised but are nonspecific. There may be serum antibodies detectable in some patients but there are no detectable antibodies in many. The presence of antibodies is nonspecific, as they may also occur in those who have been exposed but have no disease. Despite the pitfalls of false positives and false negatives, analysis of antigen-specific IgG antibodies can be useful as supportive evidence for diagnosis. The antibody titre level may also be helpful. I have had 3 chickens in my backyard for the past 1 1/2. I moved them out of the dirt to another area with tanbark and way less dirt. BUt then I raked up their feces and lots of dust was flying everywhere. I wore a bandana over my face to protect myself but now I am concerned about getting sick? Will I come down with this lung illness? Should I move the chickens further away from our house? I have not shown any real symptoms so I think I am fine but I don't want my kids getting sick from inhaling dust on a windy day? Should I take any precautions with these birds? The percentage of people that get BFL is very low. Nobody should be inhaling dust from anything. Don't do it on a windy day or wear an N95 respirator....they don't have them for children, that I know of. I am in disagreement with the above comment. Pigeon Breeders' lung is caused by pigeon droppings. Not by the bloom on the flight feathers. I can handle my birds, outside of the loft. I'm not "allergic" to my birds. It's their poop that was causing the inflammation of the alveoli. Their flying around the loft and the antigens from the dried poop flying all over the place, makes it impossible for me to enter the loft. Even with a respirator. My husband has been diagnosed as having allergic alveolitis. We have had a budgie for 10 years and my husband showed no signs of this allergy until this year.If my husband is allergic to budgies, should this not have happened when we first got a budgie ? Alveolitis is caused by allergy. This takes time to develop, there is always a gap between first exposure and disease. Problems following first exposure mean that the exposure is toxic or irritant and affects most exposed people. Bird fanciers lung only affects a fairly small proportion of those exposed, as it is due to allergy. A gap of 10 years before disease occurs seems quite excessive. My husband is immuno - suppressed following a liver transplant 12 years ago and also has sarcoidosis of the lungs. Can either of these two problems have triggered this allergy ? My mother was diagnosed with IPF 10 years ago after going to the doctor for chronic cough and breathlessness. She stopped going to the doctor after a year and has refused to go back until now. Since she is still alive, it is obvious she didn't ahve IPF. However, her lung function has decreased from 78% to 65%. She was given a ringneck parakeet a few years before her initial diagnosis. When she went to a different pulmonologist last week, he told her she had a positive ANA ten years ago and that she likely has an autoimmune connective tissue disease. He did extensive testing for autoimmune disease and antibodies. This time her ANA was negative. But she had antibodies to mixed feathers, pigeon droppings and different molds. Her antibodies to the pigeon droppings was triple the high end of the reference range(36) and antibodies to feathers was double(11). The doctor said most people are positive and if the bird were the problem, her antibody numbers would be much higher. Is this true? She also uses down bedding in the winter. Could that be the culprit and the reason for her lower numbers in the warmer season? She is fighting getting rid of the bird. Regular contact with birds can cause pulmonary fibrosis of any kind, including a disease indistiguishable from Idiopathic Pulmonary Fibrosis (IPF). The bird exposure obviously has to come first, as it seems in this case. The precipitating antibodies (IgG antibodies) denote exposure more than disease, the disease can be present when the antibodies are negative, which often happens some years after the bird exposure ceaases. Positive Anti Nuclear Antibodies (ANA) are common in any type of pulmonary fibrosis, only if the titres are very high (say >1:1600) is a connective tissue disease the more likely cause of the pulmonary fibrosis. It is a brave doctor who thinks the bird is an unlikely cause for the pulmonary fibrosis. There are things that could make the diagnosis clearer. A bronchoscopy and high volume lavage with differential cell count of the fluid should show an increase in lymphocytes if the bird is the cause. It may be possible to take biopsies at the time which can sometimes clinch the diagnosis of allergic alveolitis (hypersensitivity npneumonitis). The CT scan can also suggest this diagnosis. Finally a trial away from the bird for at least 4 weeks might help with the diagnosis (it is your mother rather than the bird that needs to move, as the antigens from the bird are still present many months after the bird goes). Thank you for answering so quickly. I am trying to get my mother in for another appt., so I can ask questions, but the pulmonologist wants to see her at the same time as a certain rheumatologist and the earliest she can be seen is two months from now. Coincidentally, I just received the report from the CT scan she had two weeks ago. Below is the report. of contiguous 3 mm axial images. No intravenous contrast was utilized. Dose-Length Product (DLP): 147 mGy*cm. thin-walled short axis diameter predominantly around 5-12 mm. nonenlarged superior mediastinal lymph nodes. Pericardial effusion is new from previous study. Thanks again for your quick, knowledgeable and very helpful reply. I was diagnosed with Bird Fancier's lung in early 2013. I had chills, heavy coughing and my x-rays had the ground glass effect. I'd been given a couple of rounds with steriods, which had helped, prior to seeing the pulmonologist. He put me on a longer round and my lungs did clear up. We have three macaws in the house, two cockatoos in the garage. I've not had any direct contact with the birds since I got sick. I have three large hepa filter air filters, which do help. I am still in the process of trying to move the birds out of the house, but the articles here make me think I might do better to relocate to the shed for the day. I seem to be okay as long as I do not have the house closed up. I will be going in for another check up later this year. It would seem that the macaws would be better in the shed than you. Continuing exposure to indoor birds is always a risk, it is very difficult to limit your exposure sufficiciently while the birds are indoors, and even quite difficult when they are ouutdoors. If steroids are needed for you I think you come before the birds. Hi. I have a Green Cheeked Conure who seems to be causing some breathing problems. My symptoms are tightness in the chest with slight wheezing and a thick clear sputum. My chest also feels irritated. I am asthmatic and take preventative medication. I also have allergies to grasses, dust mite and quite a few animals including cats and horses. My allergy specialist did an IgE test for parrot feather but it came back negative. I have had the test twice. The first was 8 months ago and the second just recently. I am still not sure it is the bird however I do seem better away from him. Could it be his seed? The bird is kept inside and I have quite a lot of direct contact with him. I have had him for 10 months. I really don't wont to part with him but I will if I can't find a solution. Hypersensitivy pneumonitis (EAA) is much more likely to be due to the bird than asthma. IgE may be negative, the test should be with avian IgE (precipitins). The disease affects the alveoli and is best diagnoses with measurements of gas transfer (DLCO) Seed allergy causing asthma is also a possibility. If you are better away from the bird, this seems a good way forward. I have just bought a budgie for my son. His father has cystic fibrosis and is concerned that his health may be compromised by me having the bird at my house. Can my son carry allergens on his person that, when he goes to his father's house, may cause him to develop bird fancier's disease and further damage his very sensitive lungs? Your thoughts on the saturated fat concept in extrinsic allergic alveolitis? Have read about it in Racing Pigeon Digest. in 2011 I had a bilateral lung transplant.For 3 years my pft'ss were in the 4.5range.today pft's are 2.70 to 3.05.in feb 2014 pft was 4.58. could having a canary have affect on this sudden drop? I am in rejection and rate 2a on scale used to determine rejection level. Is it the feathers or whats on the feathers? If the Mayo histology of your Lung biopsy shows hypersensitivity pneumonitis, this is probably the correct diagnosis, it doesnt however give any clue to the cause. If your breathing problems started after you got rid of the cockatoo, it would be an unlikely cause of your HP. Dental technicians are at risk of a large number of occupational lung diseases, particularly asthma (from acrylates and latex amongst others) and silicosis (from sand blaasting). Some of the metals may also cause asthma, particularly chrome. HP is not common, but cobalt can cause a similar disease (giant cell intersitial pneumonitis, GIP). If your symptoms started while working as a dental technician, and particularly if you got better and worse with work exposures (at least at the beginning) it would be worth rechecking the biopsy for GIP. Finally from a treatment point of vie there is some suggestion that Retuximab may help when all else has failed. Thank you for your fast response. Upon reading it and after my son read it he remembers me starting to have trouble while I had the bird. With that in mind do you think that maybe there is the possibilities that it could of triggered this? I am going to look into having more test done in relationship to material I have used being a master dental technician. I have used all the material you listed and more including beryllium alloy. There has been no mention of me having idiopathic pulmonary fibrosis so I hope that is ruled out, unless it has a another title to it. Do you think I should also get check for precipitins if not already done? What do think of getting on some clinical trials or seeing if I qualify for lug transplant? My grandfather has owned poultry houses for about 20-25 years. About a year and a half ago he started having problems. At first they kept thinking it was pneumonia but after treating that & nothing helping finally narrowed it down to something in or around the poultry is causing his sickness. He stayed inside the house for 1 month, without going outside, & got well. However, as soon as he stepped outside, he was sick again. He has since sold the poultry houses & bought an RV so he could stay away from the farm. But every time he goes to town, if he comes in contact with anyone that has been in or near a poultry house, he gets sick. If he passes someone hauling chicken litter, he gets sick. If he passes a live haul truck, he gets sick. He doesn't believe it is his lungs bc it doesn't seem to effect his breathing but anytime he has an 'attack', the first thing to happen is his throat closes up & he can't talk for the following 7 to 10 days. He has been to numerous doctors & no one can seem to figure out what is wrong. Does anyone have any ideas as to what may be going on? Or where he could find help? They have done epipens, with no relief. They have thought it was acid reflux, which we know it is not. Feel free to email me if you have a solutions. amandallen05@hotmail.com please put 'help for your grandpaw' in the subject line. Thanks so much! . I should of specified, when he stayed in the house for 1 month, it was inside his home. I was finally diagnosed with ILD in 2015 after 4 emergency (ER)trips and a total of 3 weeks in the Hospital on steroids and antibiotics. All the lung specialist and Pulmonary Doc's said I had Pneumonia, all the x-rays and CAT scans were showing small black spots all over my lungs. I had told all the Doctors about the many indoor birds my wife had accumulated over the years and no one seamed concerned. Thank God I found a specialist who was aware of ILD (Pigeon Keepers Disease). He sat down with both me and my wife and said the birds have to go or I would be dead in three years. Big problem was my wife wanted to keep the birds and isolate the birds in a separate room in the house, Doc said no due to the ventilation system would keep circulating the feather dust with the fungus mostly from the African Gray. So we actually purchased a 10X12 shed, and insolated it, ran electric to it for heat and AC. So my wife get to keep her birds and I get to live. I'm doing great now, walking 4-5 miles daily, beats the 10 yards before sitting down. forgot to add the ILD information, basically the fungus scars the lungs causing a decrease in the oxygen exchange to the blood stream. I was at 50%, not good. Interstitial lung disease is a group of lung disorders in which the deep lung tissues become inflamed and then damaged. Causes. The lungs contain tiny air sacs (alveoli), which is where oxygen is absorbed. These air sacs expand with each breath. The tissue around these air sacs is called the interstitium. Thank you so much for this comprehensive site. Can I ask, if I suspect I have allergic alveolitis, do I need to do anything other than avoid birds? I've had recent exposure and developed a cough and slightly crackly chest, will that settle down on its own? Bakground - I am asthmatic and tested positive for allergy to dust mites, feathers and animal dander as a child. As a result, my mother got rid of all feather bedlinen and started keeping our budgie scrupulously clean. I did notice my asthma got better when I was away from home, but my mother put this down to being away from my dad's heavy smoking. I'm wondering now whether it was the bird. I do think I have asthma as well, as I continued to have asthma as an adult, even though I've always avoided birds and pets. What has made me wonder about the alveolitis is that I've just spent time helping my sister eBay some items. The items were stored in the loft - she recently had the roof repaired and the items had got dirty from soot and pigeon droppings dislodged during the work. I handled the items and helped to clean them up. On the last day of my visit I developed a "cold", and then a cough. The "cold" lasted a day if that, but the cough has persisted for several days. The other thing that makes me wonder about the budgie is that when I had my X-ray before emigrating to Australia (which was thirty years ago! ), the doctor noted that I had some scarring on the lung, which is not typical for asthma. From diagnosed with ILD, I forgot to mention that my Doctor required that I have all the heating and AC ducts cleaned before I could enter the home again. And yes, all pillows or down filled items removed. I also have large filteration system on my furnace that uses a 20x25 2200 filter that is 6" in depth. I change filter every 3 months. We have an additional portable Honeywell 7400 air cleaner in the bedroom. My Doctor also noted that he has had women patients who are diagnosed with ILD who are so attached to there birds (African Grays or Bungie's) are the worst, who have died because they are to attached to the birds and won't remove them (can you believe that?) Darwin theory for sure. I have PBL and refused to give up my birds. I am "allergic" to their poop, so never enter the enclosed loft. Even with a mask. Was diagnosed in 2007, at which time they weren't even doing tests for bird allergens in the US, except at Ohio University. Since that time, they now do all the tests here in the states. I found out I am NOT allergic to my B&G and he is welcome in my home. The pigeons have an outdoor loft and aviary and I am able to handle them in an outdoor exposure with no problems. We are a happy family and I continue to release my birds at ceremonial events and get the pleasure of seeing the joy they bring to others....as well as myself. Good doctors and good safe actions on my part. Where there is a will, there's a way. I had posted my diagnosis of Pigeon Keepers on 02/08/2016. My Doctor said to my wife that the birds had to go or I would have 3 years at best. My wife wanted to keep her beloved birds in a isolated room in the house, but my Doctor said if the room shared heating and air conditioning vents with the rest of the house it would'nt be an option. So we purchased a 10x12 shed, totally insulated it with R-13 insulation. Added a safe space heater and a window air conditioning unit. She gets to keep her birds, $1500 fix. I have pictures of completed project if anyone wants them. Congratulations! I couldn't find your original post. They were pigeons you kept in your home??? What kind of pigeons? a pulmonologist recommended that I get blood work to determine he cause of patchy opacities in my lungs. The test revealed that I had a "a high exposure to pigeon droppings', I'm assuming this means that a high level of antibodies caused by avian antigens. The problem here is that I don't have any exposure to birds. I didn't grow up on a farm and no pet birds. The only thing I can think of is my pillow has down feathers. Could that be it? Or perhaps being around my cat and exposure to to her litter box and feces? Any thoughts? I am asymptomatic- no shortness of breath, coughing or wheezing. "confusing" or "cross-reacting" antigens come from the bacteria present in bird droppings. This can produce positive avian tests when the cause is from another source of bacteria. Common sources would include contaminated humidifiers or dehumidifiers in air-conditioning systems (either local or in the plant room of an air-conditioned building, or occasionally in a vehicle), or fountains, hot tubs and other sources of aerosols. To make sure that it is not a bird, the tests can be repeated using avian blood as the antigen, which should remove cross-reacting antigens. If these are negative and the droppings tests are positive another source is likely. The doctors in the USA are still really clueless about this disease. When first diagnosed in 2007, there weren't even any tests available. I was terribly ill and HP diagnosis made through x-rays, ct scans and, of course, the "sounds" in my lungs. I was on prednisone and oxygen 24/7. I am now off oxygen therapy and have not had a recurrence for several years. I have kept my flock of 50 to 60 pigeons and continue to handle them outside the loft for ceremonial events. I stay out of the lot and rely on others to clean and collect birds for me for release. I recently requested the Immunoglobulin study. The doctor had no clue what to order, so the lab just pretty much did them all. There is no "negative" or "positive. IgG, subclasses (1-4) were all withing normal range EXCEPT IgG, Subclass 1 being low. 351 with the range being 422 - 1292. I have repeatedly called and left messages with the pulmonologist's office and have yet to receive a return call. E215-IgE Pigeon Feathers was <0.10. I see no test for feces. Can someone here help me, please? Thank you. Again, these tests were not always available here in the USA and my physician didn't think they were necessary anyway. Simply treat me for HP and holler at me to get rid of my birds, but I didn't. This is not bird related - but I'm desperate!! My 16 year old daughter has had chronic fatigue symptoms for 2 1/2 years now. She had 2 guinea pigs in her room, I can't find any info online about anyone getting sick from their feces or urine. Is it possible? You are concerned that she may have PBL and transferred it to you? Doubtful. IMHO. Is it safe for someone taking immunosuppressant drugs to live in a home with several pet birds (approx. 30 parrots/cockatiels/finches)? My spouse does not want to part with them and we can't afford to build a separate space for them. There should be no increased risk with exposure to healthy birds. Bird fanciers lung is an allergic disease and suppressed by many immunosuppressants. If the birds cary the infection Psitticosis (ornithosis) there might be an increased risk of infection, but this is much rarer in native bread birds. I recently acquired a wonderful umbrella cockatoo. I've had him in my home for almost 3 months. My home doesn’t have recirculating air. A week and a half ago I was admitted, through the ER, to the hospital for "asthma aggrevation". My SPO2 was 82. Testing found no bactrrial, viral or other known reason for this. I suspected my bird and told them but no test was done for BFL. My asthma has been well controlled with 0 hospitalizations. I had to go off my normal inhaler due to finances (insurance charge was $355.00. I was hospitalized for 3 days. I have been home for 1week and am having asthma symptoms again (WITH medication.) Any suggestions or thoughts? Please and thank you! You were hospitalized for 3 days and no tests were done??? Are you in a 3rd world country? Asthma advice? Could be because you were off of it for a while. I sincerely hope that you have a good doctor....or get a better one. There is no way to know if you have hypersensitivity pneumonits without a scan. I am just in awe that this wasn't done in the hospital. You were away from the bird for over 3 days, so your symptoms should have improved. It's obviously not due to the bird. Asthma and bird fanciers lung (hypersensitivity pneumonitis) are different diseases. Asthma due to indoor birds is quite uncommon. Hypersensitivity pneumonitis, particularly in the acute form, if often associated with fever and weight loss, your doctor should have been able to hear crackles on listening to your chest. It seems that your asthma got worse when you stopped your inhalers, not a great surprise. If you want to find out whether your bird is responsible without great cost, the best thing to do is to go and stay away from your home for 1-2 weeks, preferably monitoring your peak flow several times a day, and then continue readings after you return home, keeping treatment constant throughout. If you are better away from home and worse at home it at least points to a cause in your home, of which the bird would be possibility. It is important for you to move rather than the bird, as bird antigen can remain in your home for a long time after the bird has gone. I am in my early 30s. I have history of asthma and allergies but only take an inhaler once a year if I have the flu possibly or am exposed to cats (I am allergic to most animals with fur). I have no allergies to birds when tested 4 years ago. I have owned a conure (low dust) before for three years and a budgie for 2 years. We recently added another budgie and things were fine for a few months. Then we added two more (two boys and two girls as we wanted two pairs) and I feel a bit short of breath the last two weeks. I am always between 350-400 on my peak flow meter which is rather normal for me and that has not changed. But I feel sleepy and short of breath the last two weeks or so.. Does this sound like bird fanciers lung? I am allergic to general dust. Is it possible the dust is bothering me a bit without it being bird fancier's lung? If I bought a good quality air filter and mopped weekly would that help? I'd hate to have to give these little guys away. They are family pets. My child would be devestated. Thank you. Hi all, I'm the "umbrella lady". Just to straighten out some confusion. I have asthma and it has been well controlled for about 2 decades on Advair. Although I did go off the Advair for a month, I believe it was just a cozoccurance with the issues from my bird (I do know that asthma and BFL are two seperate issues). Anytime I was close to my bird when he was posturing (if you have a cockatoo you know what I mean) or "fluffing", I would have a fever of 100-101° that night with it breaking, normally, in the early am hours. This happened about 8 times over the 3.5 months I had him. Couple this with the shortness of breath and the weight loss, 22 pounds over that same time frame, and the overwhelming fatigue, I started looking for my own reasons and came upon this site. I also want to mention that the x-rays were not remarkable. Unfortunately, I decided own my own to re-home both of my birds. I am doing a bit better since but am still no where close to whereI was 5 months ago. I have an appt. with a pulmonologist on 4/3/17 and hope to get to the bottom of this. I'll keep you all posted. Oh, in answer to the question, "Do you live in a 3rd world country? ", the answer is no, I am "blessed" to live in the United States of America. The story you provide with delayed fever, breathless and weight loss are characteristic of acute hypersensitivity pneumonitis, the fact that attacks occured after contact with you cockatoos is strongly suggestive of them being the cause. I think removing the birds was wise, irrespective of any test results that might now follow (your radiology and lung function may be normal away from exposure). I am 22 and have owned a budgie for the last 10 years. And he stays in my room (when it is not sunny, so probably about 60% of the time) where he flys around and stuff. I have just become aware of all this. I know this sounds cliché, but I am too young to die. I am not going to get rid of my budgie, but I just bought a massive cage so I can leave him outside now, and wheel him into shelter during night. I need to know EXACTLY what tests I need to get. I need a list so I can literally give the list to the doctor and say "i want all that checked" and they can do it for me. I just spend a shitload of money on things that are supposed to be good for you lungs (supplements, a heap filter, breathing trainers, and an altitude machine to simulate your room at high altitude). God, I hope it is not too little too late. I'm not keen on getting radiaton to the lungs as apparently THAT in itself can cause lung cancer. man, I need to calm down, but how can I when I am probably literally the perfect canidate to contract this disease? I know one thing for sure, If I truly am screwed, I am gong to take the biggest dose of psychedelics I can and hopefully come to terms with my own death. actually I just found some old pictures with dates on them. I have had my budgie for 13 years. I have literally been living half my life being exposed to this dander. The first thing to do is to have a definite diagnosis of hypersensitivity pneumonitis. You seem to have had many of the tests, crackles in the lung are an important finding, if you precipitins to avian serum are positive and your DLCO low, hypersensitivity pneumonitis is likely. It is best confirmed by a high resolution CT of your lungs (risk much lower than keeping your budgie if you have HP), and a bronchoscopy with lavage and differential cell count (more than 30% lymphocytes very suggestive). If the diagnosis is confirmed HP due to birds you then need to choose between your health and the bird, the longer you leave this the more disabled you are likely to be longterm. Wheeling you bird outside is not the answer. I'm not sure I understand your post. Your "list" - are those the things you have had done? The results are? Your symptoms are? Do you have any symptoms? Your post was really vague. Are you simply worried about the possibility of getting this disease? If, indeed, there is "crackling" heard when your physician listens to your lungs, the very first thing he should have done was order a CT. Sometimes the x-ray is not sufficient. The doses of radiation are minimal and should not be a worry at all. Questions can be better answered when you answer my questions. Forgot to ask....did you get the pulmonary function study - or is it just on your "list"
Sorry I keep thinking of things to add to my comments. Wheeling your bird outside MIGHT be the answer. I have Pigeon Breeders' Lung. Hypersensitivity pneumonitis. Diagnosed. I still have 60 white homing pigeons and continue to do ceremonial white bird release. I am allergic to what their poop produces and circulates in the air of the loft. Yes, their loft....they are outside in their own loft/coop. I cannot go into the loft, but I can handle my birds outside the loft. I will be more explicit, when you are more explicit and definite answers can be given. I apologize, I was a bit hysterical in my initial post. I will try to clear up the confusion. I have not had any of those tests done. I haven't been to a doctor in over a decade. I was asking for what tests I need to have. I wanted to make a list of exactly what tests is needed to determine if someone has the disease. I currently have no symptoms of the disease (that I am aware of), but I am worried that all these years living with my budgie will have done the damage and I wouldn't even know it until its too late. So basically, yes, I am simply worried about the possibility of getting the disease. hopefully that clears it up a bit. let me know if theres anything else and I will answer anything else. The important thing to find out is whether you have hypersensitivity pneumonitis or not (crackles, radiology, DLCO and probably bronchial lavage if the other tests are positive). Next to find out whether the birds are the cause or something else (precipitins and perhaps a trial of separation; if so it is you who has to move not the bird, as the bird antigens will be present in your house for months after the bird has gone). Hypersensitivity pneumonitis is a type of allergy, some get it and some don't. If you are not susceptible there is no problem with long-term exposure. I disagree with the above. If you have no symptoms, all the first tests mentioned will be negative. It is never "too late"....oh wait...it could be if you ignored the symptoms, but that's not what we're talking about here. There are no symptoms. There is no "crackles", so there would be no reason to get an unnecessary CAT scan. When you have an acute or chronic exacerbation of the disease and the doctor hears crackles or you are having other symptoms (flu like symptoms, shortness of breath, fever, etc), abnormalities on lung function studies (which won't be ordered for no reason at all....without symptoms) he or she will order a CAT scan. If it indeed shows ground glass like opacities, it is a sure diagnosis of hypersensitivity pneumonitis also called extrinsic allergic alveolitis. After treatment that ground glass appearance will go away. You will need to follow the correct protocol, after that, to make sure it doesn't come back. I would personally (and did so myself) see someone that specializes in allergies and immunology. He should know the proper testing for this. I doubt if a physician would order all the tests you want without any reason.....you have absolutely no symptoms. Perhaps you didn't read my post fully. IT WON'T BE TOO LATE. I was REALLY SICK. On oxygen 24/7. I am now quite healthy and still have my birds....outside....and do not go into the coop....but handle them and enjoy them outside of the coop. to 1st reply. If I were to move to a new house (which I am planning on doing), would it be ok if I bought my budgie with me, BUT never have it in the actual house at all, and only have it in the back yard? (and I would buy a full face respirator when I go outside. also wear a specific set of clothes and not bring them in the house). would the antigens still be present in the house if I took those precautions? to 2nd reply. That makes me feel a bit better knowing you can improve even if you do have it. I will make sure I go to a allergy and immonulogy specialist. I will make sure the doctor can give me a referral to see the lung specialist, even if I have to see multiple doctors. I want my lungs function fully tested, and a full allergy testing to put my mind at ease. if everything from those appears fine then I might not worry about ct and xrays. Also, you said that after treatment the ground galss appearance goes away, what treatments are you reffering to (I thought that this was an incurable disease if it is in the chronic stages). Also, I am glad that you are healthy again and can still keep your birds. also, I should say, I have not been checked for any crackles on the lungs as of yet. however, about 6 months ago, I did see a doctor about a possible cracked rib (I lied about not seeing a doctor in a decade, i have only seen a doctor once in a decade lol), and he put the stethoscope on my back and made me breath in, and he said all seems fine and that i probably didn't have a cracked rib. BUT maybe he was not listening 'specifically' for cracking on my lungs. is crackling of the lungs something that is easily picked up by the stethoscope or is it one of those things where they really have to be looking specifically for that issue to identify it? You don't have the disease. Prevention is always smart. It is NOT a common disease. It is more common in non-smokes and MOST common in ex-smokers. FYI. But, again, it is a relatively small percentage of people that get it. Is there a test that can be done to determine if it's birds or mold causing the HP? My husband has HP, He has had a bronc done. I would like to have the DR test the tissue to find out what's causing the HP. Thanks! Yes. Of course. When I was diagnosed with HP it was through imaging. At that time (2006) the only tests available for bird fanciers' lung was in the UK. It is now widely used here. Your pulmonologist should know exactly what to order for the antigens. Or an immunologist. Where are you located? I had 8 budgies and 1 canary and developed asthma so I rehomed them as we thought I might have bird fanciers lung (I was diagnosed with Asthma and take some puffers to help with the cough). I miss having birds very much and am thinking of purchasing a glassed in aviary cage with a fan inside to home 2 gouldian finches. Do you think this will trigger my asthma? I would not be in the same room as the cage for more than 2 hours per day. I was told that bird fanciers lung is only associated with certain kinds of birds. Also I will be purchasing an air purifier for the room to be safe. Do you think this would be ok? I agree completely with the above post. You need to know what caused your asthma, if it indeed was asthma. I definitely have hypersensitivity pneumonitis and am able to keep my white homing pigeons by staying completely out of their outdoor aviary/loft. I can handle the birds outside the loft with NO problems. HP can be from any type of bird and there are tests available now to distinguish that. When I first became ill in 2007, the tests were only available overseas. They have them all here now. I live in Florida, so an outdoor loft/aviary is great for them. Hi I want to know if Hypersensitivity Pneunonitis can be caused by a dog? Hi, I have just come back from a GP appointment having been told my blood tests indicate Bird Fanciers Lung. I noted that the blood test said pos to three different things, one being pigeon serum. GP doesnt know anything about the disease, so I have booked back in with the respiratory specialist. He is away for the next week though, so I am unable to get further info. Had terrible coughing fits. Saw GP mamy times who had various diagnoses, but eventually started to hear strange chest crackling. Also had chest CT that showed an infection. After a course of antibiotics a new CT scan showed clear lungs and I no longer had trouble exercising/coughing fits (though I do find I have to clear my throat a lot still). On return to the GP on a separate matter, she noted the blood test results and can still hear the crackling in my lungs. 1) Should I assume that I should start making preparations to rehome my budgies asap? 2) Google is showing terrible outcomes of people being given three years to live/having to move houses. How often does this result in such extreme measures? 3) Since this seems to be an allergy, why would the antibiotics help? (I am guessing perhaps it made my lungs vulnerable and I got a separate infection, but a professional opinion would be appreciated). It sounds that hypersensitivity pneumonitis is likely from the crackles and positive blood tests. There is a lot of cross-reactivity between pigeon and budgerigar antigens, and a positive to either with bird exposure, symptoms and crackles makes hypersensitivity pneumonitis likely. There is no evidence that antibiotics help HP, which is commonly initially diagnosed as infection. The prognosis after removing exposure is usually good. The 3 year mean survival applies to idiopathic pulmonary fibrosis, a different disease. The budgerigar antigen can remain in your home for many months after the budgerigars have gone. The usual advice is to thoroughly clean the rooms were the birds have been including the walls and floors after the birds have been completely removed to somewhere you are not going to visit. Your bird blood tests should decline if removal is successful, perhaps halve every 6-9 months. This can show you that removal has been successful. Your lung function tests should improve, but (particularly the gas transfer, DLCO) may not get back to normal. If you are not convinced of the need to remove the birds completely you can monitor your peak flow at least 4 times daily for at lest a week with the birds, for at least 2 weeks completely away from your home (on holiday) and then 2 weeks back at work, an analyse these with the Oasys plotter available from this website. Thank you for the quick response. I found it hard to find out what the outcome is for this diagnosis, so your help is very appeciated. Fortunately my budgies were from a good breeder and I was able to talk with then today about being taken back. I've read through this forum and am greatly concerned and very glad I found this information. I am a 53 year old woman who has lived with my first born, a blue fronted amazon since I was 11 years old. Is it possible to develop an allergy to the birds? like during stress or ? I've never had asthma but a few months ago, during a heavy pollen release, I was unable to breathe but this passed, however, since then, and possibly before, I have noticed the crackling sound in my lungs. I am a light smoker and figured I need to quit. During the holidays family brought us a nasty cold. I am a firm homeopathic believer and practice this, staying as far from the doctors and hospitals as I can. I live in the states and don't have much faith in our medical system. I have always been able to up my regimen of supplements and avoid colds easily. Not this one. I fell ill and then was unable to breathe again. I ended up in hospital and was given nebulizers and prednisone. Not happy about this but happy to be breathing. My bird lives in a room next to the one I sleep in, after coming home from hospital I was breathing well until I went to get in bed. A friend mentioned my bird may be the problem and I found this site. I'm hoping I can find a general practitioner to follow through the testing process with me to determine if it is my beloved bird. can we just develop an allergy? where do I start? You start by needing good evidence that your blue-fronted amazon is the cause of your breathing problem. If your disease really is asthma, your bird would be a fairly unlikely cause. If however the disease is hypersensitivity pneumonitis, your bird is a much more likely cause. A reasonable medic with lung function testing should be able to separate them (one is obstructive, the other restrictive, this means that the ratio FEV1/FVC is low in asthma and normal or high in hypersensitivity pneumonitis). Hypersensitivity pneumonitis may also show up on X-rays, were as asthma does not. Both respond to steroids. One thing you could do is keep a peak flow record as described in the peak flow sections of this website. Any treatment needs to be kept constant. After recording for a week at home, you need to leave your home and bird and have a holiday elsewhere, but continue keeping peak flow records, and keep going for a least a week after returning home. It is much better for you to move rather than the bird, as the bloom and other bits of the bird will remain in your home for months after the bird has gone. Some doctors may be sceptical of using peak flow to monitor hypersensitivity pneumonitis, if so they need to read the attached paper.